Oleh Manzyk shines for Neshaminy as an inside linebacker and receiver. 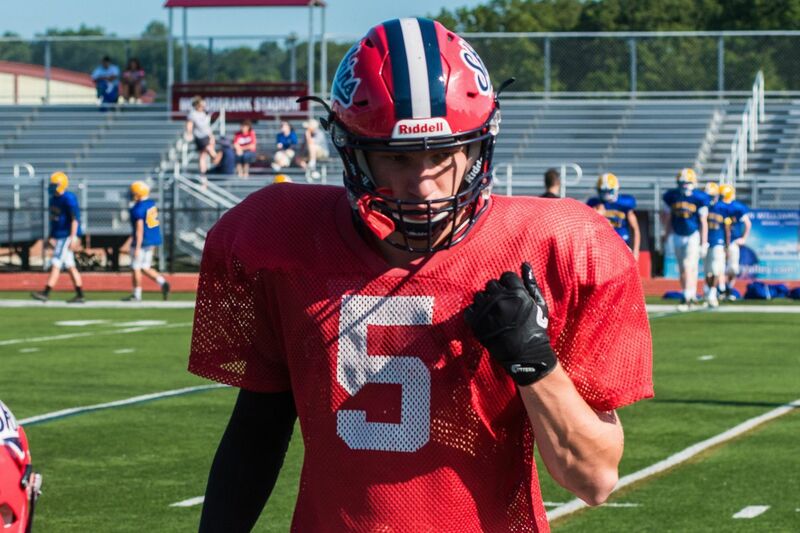 Oleh Manzyk has made a big impact at linebacker for Neshaminy's football team with his ball-hawking instincts, quickness, and toughness. The 6-foot-1, 210-pounder last season registered a team-high 78 tackles, with 53 solo stops, as the Redskins went 10-2, won the Suburban One League National Conference, and advanced to the PIAA District 1 Class 6A quarterfinals. "I give a lot of credit for that to my coaches," Manzyk said. "They do a great job of breaking down the other team's offensive strategy." Neshaminy linebacker and tight end Oleh Manzyk walking off the field after the Redskins’ 21-20 defeat of Suburban One League rival Pennsbury last season. Manzyk, a senior who is also a threat as a pass-catching tight end, has scholarship offers from New Hampshire and St. Francis (Pa.). The 17-year-old from Feasterville has also drawn interest from Delaware and Villanova. Manzyk, who has squatted 515 pounds and bench-pressed 265, is one of many stalwart defenders in Southeastern Pennsylvania this season. Haverford School's Asim Richards, a 6-4, 285-pound end, has narrowed his list of college choices to Boston College, Duke, Maryland, North Carolina, Tennessee, and Virginia. The area also features stellar linemen in Northeast's Omar Speights (an Oregon State recruit), Garnet Valley's Cade Brennan (Bucknell), Coatesville's Tione Holmes, Cheltenham's Marcus Winfield, and North Penn's Julian White. Conwell-Egan's Dwayne Majors, Imhotep Charter's Zymir Cobbs, Malvern Prep's Harry Stinger IV, Penn Charter's Ryan Maloney, and Frankford's Danny Lewis are likewise forces in the trenches. Malvern Prep’s Keith Maguire (right) bringing down St. Augustine Prep’s True Robinson in last season’s opener. At linebacker, Malvern Prep's Keith Maguire is a hard-hitting 6-2, 215-pounder, The Clemson recruit is also a four-star player, according to Rivals. Like Manzyk, Maguire also shines as a receiver. His one-handed touchdown grab last season against Inter-Ac League rival Haverford School was one of the plays of the day on ESPN's SportsCenter. Central Bucks South’s Matt Norris (right) grappling with a Pennsbury player in a PIAA District 1 Class 6A first-round playoff last season. Other linebackers to watch are Central Bucks South's Matt Norris, Downingtown East's Connor Noble, Imhotep's Sy'Mear Williams, Germantown Academy's Jack Sheridan, Central Bucks East's Drew Bethke, and Archbishop Ryan's Colin Boyd. Maguire's teammate TyGee Leach is one of the best secondary players. A free safety for the defending Inter-Ac champs, the 5-10, 185-pound senior has committed to Lehigh. St. Joseph’s Prep’s Zach Bouggess (36) and Jack Sutton (15) combining to tackle Parkland’s Dominic Nelson in a PIAA Class 6A quarterfinal last season. Imhotep's Tykee Smith, St. Joseph's Prep's Zach Bouggess, Lower Merion's Jalen Goodman (Villanova), Neumann-Goretti's Tysheem Johnson, Episcopal Academy's Jack Bush, Father Judge's Katob Joseph, and Bishop McDevitt's Lonnie Rice are also stellar backs. Smith, a senior projected to play safety at the next level, is slated to announce his college decision at 2 p.m. Thursday at Imhotep. His finalists are Baylor, Maryland, Michigan State, North Carolina, Syracuse, and West Virginia. Johnson, a sophomore who made eight interceptions last year, already has scholarship offers from Baylor, Tennessee, and Virginia Tech.